Light level is critical for drivers of military vehicles. They must be able to operate them during the day or at night, in all weather conditions, and even surrounded by smoke. The knowledge of their vehicle’s direct environment is critical in allowing them to drive to the right destination. 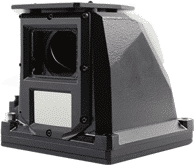 The DVE module of PeriSight allows drivers to do so by providing vision from a medium field-of-view optronics system, including colour low light and thermal sensors and by allowing them to switch between two vision modes.